ONE said the “sleeping flags” will serve as a reminder of the reality for some people who served their country. 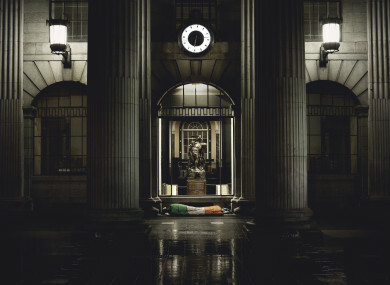 THE ORGANISATION OF National Ex-Service Personnel (ONE) are aiming to raise public awareness and support for homeless Defence Forces veterans through a campaign launching today that will see them in specially-created tricolour sleeping bags around the streets of Dublin. The charity says the “sleeping flags” will act as a symbol which challenges how we think about the Irish flag and highlight the reality facing some current and future veterans in the Defence Forces. In the sleeping flags are veterans from the Defence Forces, including some who had been homeless and had accessed services run by ONE. ONE CEO Ollie O’Connor said: “Our first homeless hostel opened in direct response to a number of veterans dying on the streets of Dublin. Since then, we’ve helped over 900 homeless veterans from all over Ireland who could have faced the same situation. These Sleeping Flags are bags we never wanted to make, but if we can’t get enough funding, our veterans will end up back on the streets. Many veterans come to ONE dealing with depression, disabilities, post-traumatic stress disorder, or having suffered family breakdowns with little to no support around them. The charity provides 16,000 bed nights every year between its services in Dublin, Letterkenny and Athlone with almost all veterans moving on then to permanent housing. O’Connor added: “The men and women we’re helping have a special affinity with the Tricolour. These are fathers, mothers, brothers, sisters and our next door neighbours who joined the Irish Defence Forces to serve their country. When they joined up, they were young fit men and women. They didn’t put up their hands to become homeless veterans. Email “Charity to bring tricolour sleeping bags to Dublin streets to highlight plight of homeless veterans”. Feedback on “Charity to bring tricolour sleeping bags to Dublin streets to highlight plight of homeless veterans”.